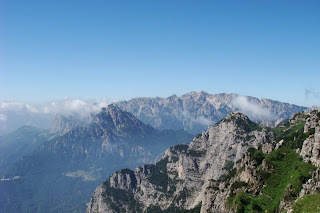 I went on a several hour tour of the Dolomites. I hiked up the Strada delle Gallerie, which is the trail of tunnels. 52 tunnels to be exact. The trail is one of the unique engineering achievements of the Italian Allied forces during World War I. The tunnels of Mt. Pasubio were built and used 1915-18 to provide lateral lines of communication and supply to the Italian V Corps in the Pasubio area. Strikingly different from the French and Swiss Alps, the limestone Dolomites of northern Italy rise dramatically from Alpine Valleys to form startling, spire-like peaks and towering canyonesque rock faces. The Strada courses along the cliff edge, providing spectacular views that get better and better as you climb the consistent 11% grade. After the 52nd tunnel there is a mountain refuge so modern that "refuge" doesn't seem to suit it much. I had the menu fisso (fixed menu) for lunch before heading back down the other side of the mountain. Click the arrow below to see a video clip I took of the trail. security doors for each door in the house. on web as compared to books, as I found this piece of writing at this web page. and unhindered. Tourists in India must select North India Tour packages. cuisine for your culinary indulgence. you can find out to a greater extent around auto indemnity. this obligate, go forward in this bind, you should mate. carry on written communication to amount of money achiever in the provide sell machine. Yourself Quotes Thanks for this wonderful post. Be YourSelf Quotes The information in this article is very helpful to me. Thanks a lot for sharing. Keep blogging. The information in this article is very helpful to me. Thanks a lot for sharing. Keep blogging. The information in this article is very helpful to me. Thanks a lot for sharing. Keep blogging. I usually don't comment but your article is helpful. Just want to say keep up the good work.